“OM NAMAH SHIVAY” RENTED THE AIR AGAIN IN OLD HINDU TEMPLE IN KASHMIR VALLEY. Srinagar, Jan 20, 2010 :The Basant Panchmi was celebrated in the Shetaleshwar Bhairav temple here, after after a gap of more than two decades. The temple, which reopened today on 20th Jan, was closed down in 1990 after the eruption of Islamic militancy in the Kashmir valley. The Shetaleshwar Bhairav temple, located on the banks of Jehlum river in the old Srinagar city, was thrown open here on Wednesday after about two decades for devotees, on the occasion of Basant Panchmi. The last mela of Basant Panchi was held in 1990, only a dozen pandits participated as others had migrated to other parts of the country because of Islamic violence here. Hundreds of Kashmiri Pandits gathered in this temple and prayed for peace and communal harmony in the Jammu and Kashmir State. The Shiva Abhisek and the Vedic Havan were the main attractions of the entire ceremony and rituals performed here. The Kashmiri Pandits on the occasion, thanked all for their support and help for the opening of this temple, which also used to be a center of community activities two decades ago. 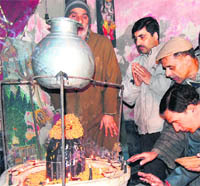 Kashmiri Pandit Sangarsh Samiti (KPSS) had initiated the renovation and cleaning work of the temple of at Sheetal Nath Habba Kadal, which remained closed after the insurgency broke down in Kashmir valley and forced Kashmiri Pandits to migrate from their homes to the other States of the country. The temple was partially damaged due to fire set by the Islamic militants. A policeman stands guard outside the Shetaleshwar Bhairav Temple, which was reopened after a period of 20 yrs, in Srinagar. Photo Credit: NISSAR AHMAD, The Hindu. Of the 585 temples in valley, shutdown by the militants, only 37 are functional at present of which 23 have been reopened in the last few years. Hundreds of temples, were closed after the mass migration of the Kashmiri pandits from here under the Islamic threat and separatist movement in early 90s and these were handed over to the local Muslims as care-taker under Govt. planning and honorarium to those Muslims without considering any Hindu rights or Hindu sanctity. Kashmiri Pandits, however, hoped that with the help of the locals the rest of the temples would also be restored soon. Nearly 3,000 Kashmiri Pandits living in the valley are facing an uncertain future. “We have suffered a lot living in Kashmir while those who migrated two decades ago have been getting the support of the government at different levels”, said TN Ganjoo, chairman of the Kashmiri Pandit Sangarsh Samiti (KPSS) on the occasion of reopening of Shri Sheetal Bhairav Mandir, Habba Kadal, here, recently. The number of KPs living in different pockets across the valley is stated to be around 2,800, according to a census conducted by the KPSS. Their number was estimated at around 17,000 during early militancy when the then Pandit leader HN Wanchoo taken up the issue of the welfare of the community. The continued violence prompted several others to move out of the valley for employment opportunities and education. “The leaders talk about secular character. We have kept it alive”, said Ganjoo, a retired teacher of Hindi from the University of Kashmir. “Those who migrated to Jammu or other parts of the state got support from the government, but those living here have suffered a lot along with the majority community,” he added. He pointed out that it was difficult for members of the community to get a ration ticket “as if we are not residents of this place”. “I have to prove myself that I am a resident of this place because we cease to be in government records. We do not even figure in the list of migrants in Jammu or elsewhere”, he said. As a result, the educated youth of the community are not getting job opportunities in the government sector, he and his colleagues opined. There are around 250 educated youth waiting to get jobs with least opportunities in Kashmir. “These young people prefer to move out of the valley to earn their livelihood”, said another Kashmiri Pandit. Ganjoo said its leaders had been meeting various political leaders and putting forth the issues and problems but no attention was being given. Sanjay K Tickoo, president of the KPSS, said the Apex Committee on KPs constituted by the government had assured that 600 jobs would be reserved in the new package for the non-migrant Pandits living in the valley, but these were denied. The Central Government had announced a package of 6,000 jobs to the KPs as part of their rehabilitation. The KPSS has also been impressing upon the Central and state governments to protect their “identity” i.e. ancient temples etc in the valley. “The step-motherly treatment has forced us to take all socio-religious centres along with their moveable and immoveable property under the KPSS,” Tickoo stated. Courtsey : ANI, NewKerala.com,Thai India, The Hindu & Tribune. This entry was posted on January 27, 2010 by hinduexistence in Hindu Culture and Tradition, Hindu Existence, Hindu Puja, Hindu Rituals, Hindu Struggle, Hindu Temples, Religious Rights of Hindus, Save Hinduism and tagged Basant Panchmi, Historical Shetaleshwar Bhairav temple, Kashmir Pundits, Kashmir Temple rennovated after 20 years, Kashmiri Pandit Sangarsh Samiti (KPSS), Non-migrant Kashmiri Pandits rue govt apathy.